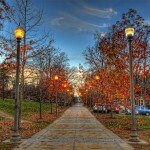 Pic A Week #42 – A Path at UCONN Rick Sammon (incredible photographer!) did an HDR workshop at UCONN earlier this month, and after the workshop I grabbed my camera and ran around campus a bit to see what I could find before the sun completely set. This was taken on a path near the Lewis B. Rome Commons.